This video collection is dedicated to mankind’s inventions! Humans are constantly thinking of ways to improve themselves and the way they interact with their environment. A lot of these efforts have led to really useful pieces of technology that are used by all of us. Can you imagine life without telephones, internet, or videogames? Still, a lot of inventions might have seem useful at the time, but are just funny if you look at them now. We’ve made a selection of clips about the most helpful, intriguing and fascinating inventions of the last decades. While technology is often taken for granted, these videos will bring you back to the time when big, and small, inventions were presented to the world. We hope you enjoy it! A Londoner invented a glass helmet with an electric fan which is supposed to protect her against the smog in the city. A Viennnese company developed a dynamic arm that can replace limbs of a patient. Item about the wrist radio: a watch-like device that allows for communication at a distance. Partner selection via a computer at the “electron” marriage institute in Zurich. The computer helps to select the most suitable partner. Michel Durieux has invented a motor-driven spade. He explains how his invention works. Electronic books allows one to store hundreds of books in one device. BBC presenter Declan Curry discusses the technology. A report about a new invention which should put an end to the misery of finding clothes that should fit. 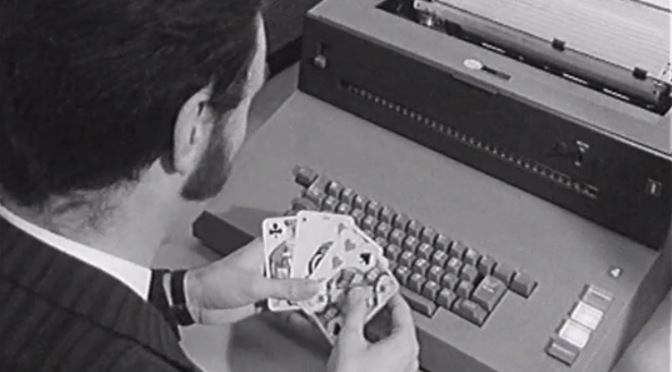 An item about a computer that is programmed to play a popular Austrian card game against a person. At the National Centre for Telecommunications Studies, new automatic terminals allow people to call one another without having to rely on an operator, and the devices’ sound quality is improved. On the Hydrogen Congress in Stuttgart, the hydrogen-powered cars are displayed. The cars are fuel-efficient, but the technology remains controversal among experts. In this program, the ability to improve one’s sight by using laser lights is demonstrated. Intelligent technology can be used to improve life in the home. The clip prospects the high tech home of the year 2015. In the 1990s, the use of internet grew rapidly. It’s potential for the tourism sector is demonstrated by the virtual Irish pub, an online pub in which ‘guests’ from all over the world can talk to each other. A report that focuses on the latest French inventions, such as the “machine-operated rug beater” and the US military’s latest invention, the “rocket belt”. We welcome you to take a look at our previous collections for more EUscreen content; In the Classroom, European Celebrations, Women’s Rights in Europe, European Theatre, All That Jazz, Film Festivals of Europe, Motorsport and Vintage Cars, Audiovisual Heritage Day, and Faithful and Furry Friends.